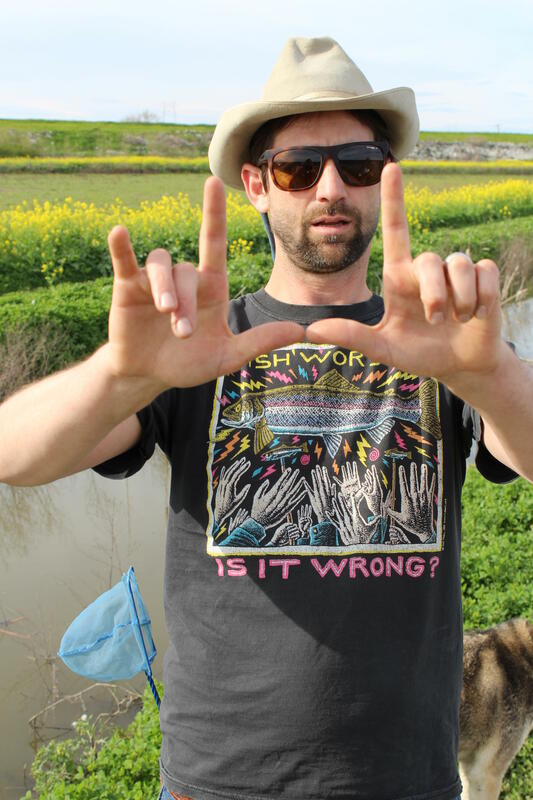 Jacob Katz, Ph.D., Central California Program Director for California Trout, approximates the size of fingerlings participating in the Nigiri Project, an innovative experiment using fallowed rice fields to speed growth and improve survival rates of young salmon. One fish, elicits whistles and hoots. This little one is a staggering 84 millimeters long. Big enough to get called a “honker.” This diminutive giant exceeds weight expectations. Jacob Katz — central California program director at California Trout — and a small team of UC Davis researchers call them floodplain fatties. After feasting for several weeks on seasonal artificial flood plains managed to mimic the natural seasonal cycles before dams and levees, these fingerling Chinook are bigger and heavier than fish released into rivers, and thus, more likely to survive, thrive and spawn. Only weeks ago they were indistinguishable from any other fry from the Feather River Hatchery. About a thousand fish were delivered this year. With the continuing cooperation of ranch managers, farmers and state and federal agencies, Katz envisions scaling the now 20-acre project up to 3,500 acres. At a fallowed Yolo Bypass rice field east of Woodland, ghostly pepperweed pokes the surface as water drains slowly away. 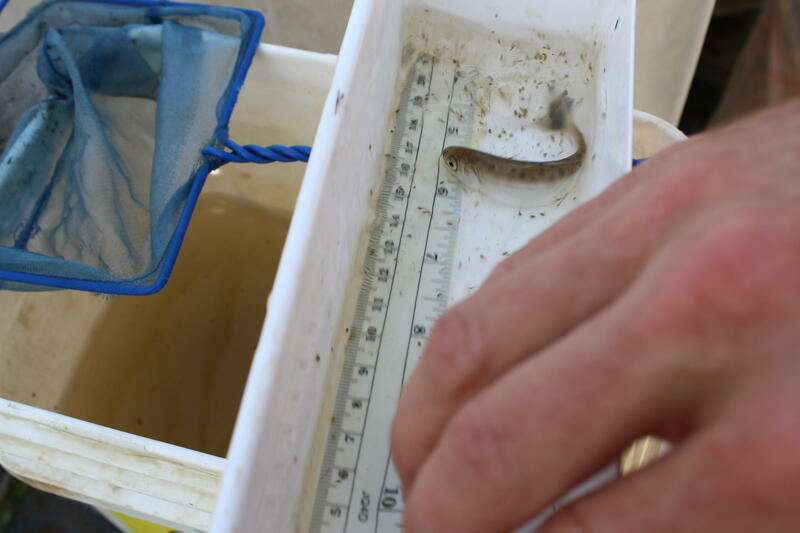 Researchers net the fish, and quickly measure them. Fingerlings spending a few formative weeks here are twice as long as and six times heavier than identical fish released as usual into the Sacramento River. In this case at least, Katz explains, size does matter. “Those bigger fish have a much better chance of making the journey to the ocean, surviving in the ocean and coming back as adults,” he said. For salmon it’s all about return rates. 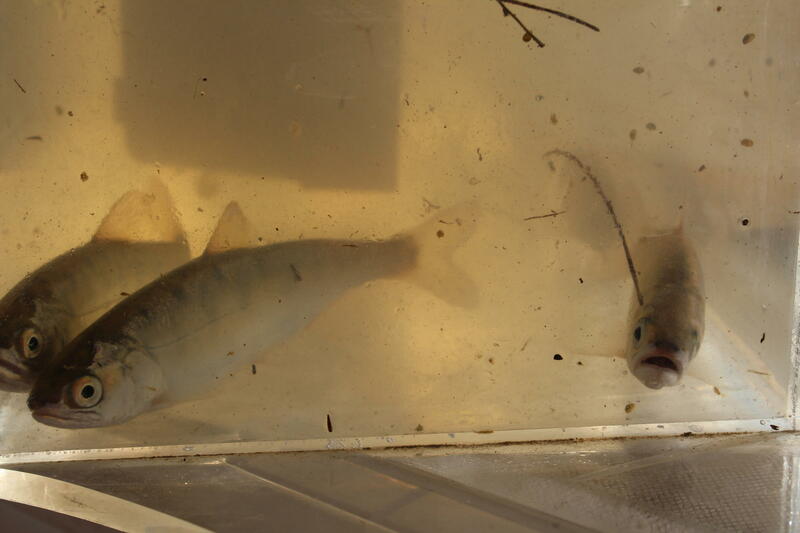 Every year, federal and state hatcheries release thirty million young salmon. About one percent come back to spawn. The rest fuel the food web. Katz and other researchers on the project are optimistic that by recreating natural cycles with seasonal flooding, that ratio could significantly increase. That’s because bigger fish have a better shot at survival. “Really, what we want to do is make them as fat as we can in the shortest amount of time possible so that when they hit the ocean they have their lunch packed,” said Carson Jeffres, field and lab director of the UC Davis Center for Watershed Science. That lunch is served round-the-clock on about 20 acres of Knaggs Ranch. The table is set by assembling perfect conditions. Water is channeled onto rice fields. It’s kept shallow, about ten inches deep, allowing sunlight to penetrate and work its magic. Katz quickly demonstrates. After waving a small aquarium net through a slowly moving canal, he empties the quarry into an open palm. A few tiny spots wriggle. Then, through the nearly stagnant rice field. His hand is practically teeming with life. Knaggs Ranch is almost entirely within the Yolo Bypass, an engineered floodplain designed to protect Sacramento from floodwaters. When the river rises high enough, the excess is diverted into the bypass, rejoining the river downstream. “And when you dip this net in, you’ll find that there’s bugs in here,” he said. “There’s actually a lot more bugs in here than there are in the river.” He calls it the bug buffet. With sunlight reaching the bottom, a thriving ecosystem is conjured. Algae quickly forms. Tiny aquatic creatures are soon feeding off the algae. Pretty soon, Katz’s bug buffet line is providing a feast to scores of hungry young Chinook. Its seasonal nature provides another benefit for salmon. Predators that feast on their brethren in the river, are largely absent here. As the experiment begins winding down for the season, most of these floodplain fatties swim down canals, into the bypass, the Sacramento and out to sea. Some have closed the roughly 100 river miles to the Golden Gate in as little as eight days. Others are sacrificed for science, committed to small Ziplock bags. Katz considers it a low stakes win for all. The water is runoff, it’s not pledged elsewhere, plus, it runs back to the river. The fields lie fallow in winter, so spring planting and fall harvests aren’t interrupted. Flooding also decomposes rice straw left after harvest, relieving growers of a headache. To the untrained eye, the Sacramento looks pretty natural. The patient and lucky can spy otter, eagle and beaver. In reality, there’s little natural. Dams and canals control its flow, levees constrain its course. 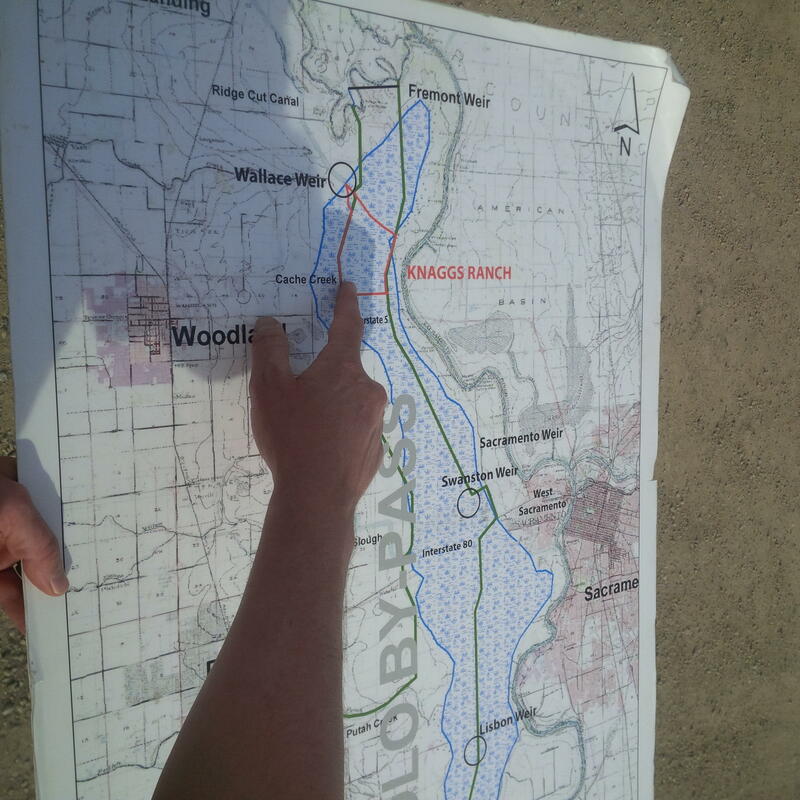 In many ways, Katz said, the project is turning back the clock, recreating elements of wild rivers. A rice field-raised fingerling wriggles as a researcher prepares to measure its length and weight as part of the Nigiri Project. Bigger juvenile salmon enjoy a ‘fin up’ on the odds of survival. “The river is not just that ribbon of water between two rip-rapped steep levees — that river water would have spread out every winter onto the flood plain and it was when it did that, when that water spread out and slowed down across the flat marshlands adjacent to the river that a huge slug of food is manufactured,” he said. In a state with a population nearing forty million, a return to historic conditions seems impossible. Katz is OK with that. With more understanding, a little engineering and a few alterations to management practices, he says California’s struggling salmon could become a good deal more plentiful. 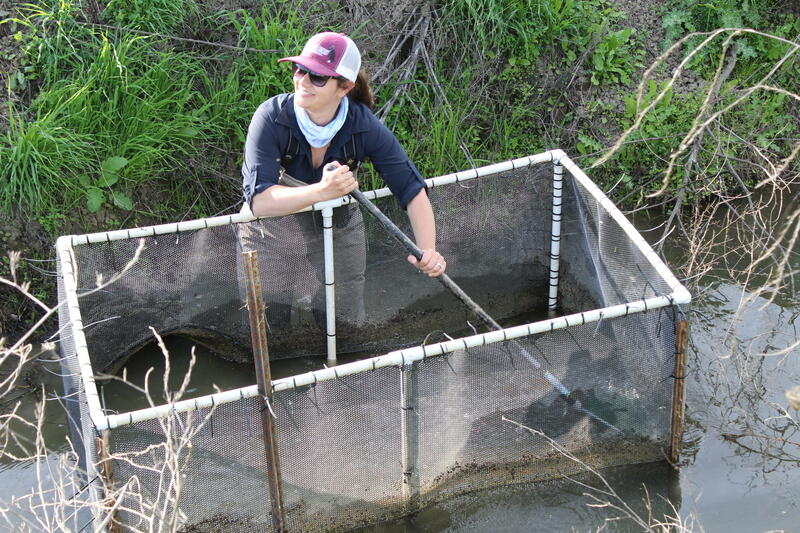 UC Davis researcher Miranda Tilcock, pulls young salmon from a makeshift trap in a Yolo Bypass canal before measuring them. Standing atop the levee is Carson Jeffres, field and lab director of the UC Davis Center for Watershed Sciences. Once released, these juvenile Chinook have made it to the Golden Gate, about 100 river miles away, in as little as eight days. 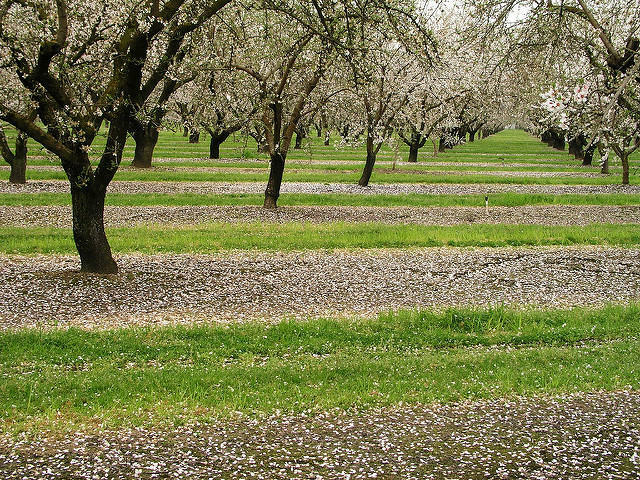 The U.S. Environmental Protection Agency is removing a pesticide used on almonds and other crops from the market, saying it is toxic to tiny aquatic insects that form the base of the food chain. 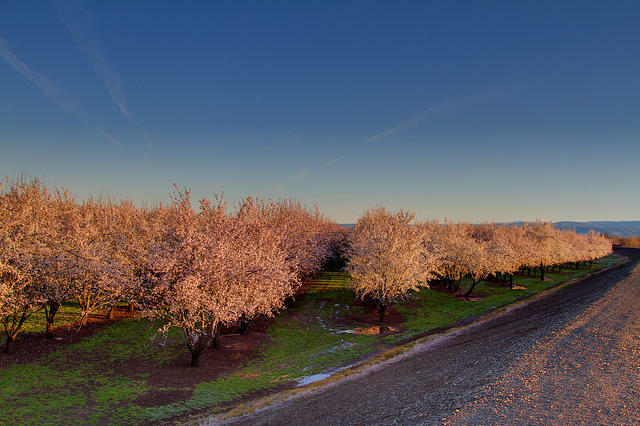 For most this week’s weather change from sunny and warm to dreary pretty much just means you need to add an umbrella to your attire – for the North State’s almond farmers it’s a little more concerning. Their trees are currently in bloom and the bees that fly around pollinating them only fly when the weather is good.